The Lymphatic System is much like the circulatory system in that it branches throughout all parts of the body with a series of valves. 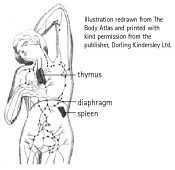 Lymph is a colourless fluid that contains a high number of lymphocytes (immune cells). It is a major component of the immune system. One of the functions of the lymphatic system is to remove excess fluids and waste products from tissues and carry nutrients to cells. When the Lymphatic System is compromised, lymph fluid can accumulate in the interstitial space (negative space between cells) and can cause swelling of the affected area.